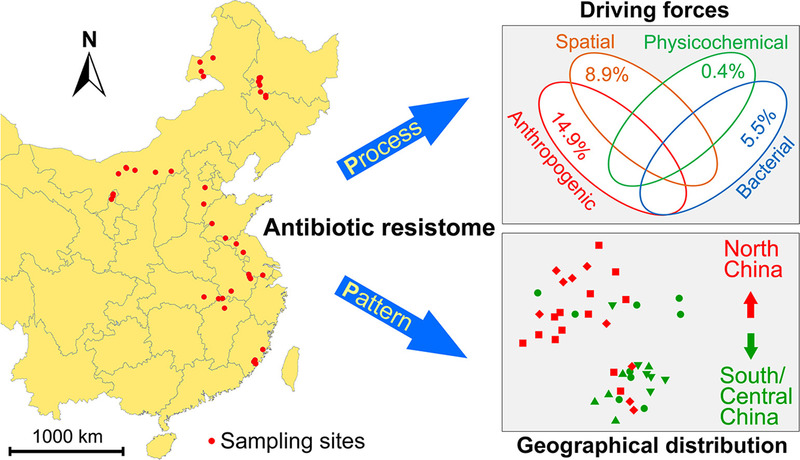 Antibiotic resistance genes (ARGs) are widespread in aquatic environments, but we know little about their biogeographical distribution and occurrence at national scales. Here we analyzed the patterns of ARGs from 42 natural waterbodies (natural lakes and reservoirs) across China using high-throughput approaches. The major ARGs were multidrug genes and the main resistance mechanism was the efflux pump. Although the absolute abundance of ARGs (gene copies/L) in the south/central waterbodies was similar to the northern waterbodies, the normalized abundance of ARGs (ARGs/16S rRNA gene copy number) was higher in the south/central waterbodies than in the north (mainly because of the aminoglycoside and multidrug resistance genes). Human activities strongly correlated with the normalized abundance of ARGs. The composition of ARGs in the waterbodies of south/central China was different from that in the north, and ARGs showed a distance-decay relationship. Anthropogenic factors had the most significant effects on this spatial distribution of ARG composition, followed by the spatial, bacterial and physicochemical factors. These indicate that the ARGs exhibited biogeographical patterns and that multiple ecological mechanisms - such as environmental selection (human activities and local physicochemical parameters) and dispersal limitation - influence distribution of ARGs in these waters. In general, our results provide a valuable ecological insight to explain the large-scale dispersal patterns in ARGs, thereby having potential applications for both public health and environmental management.